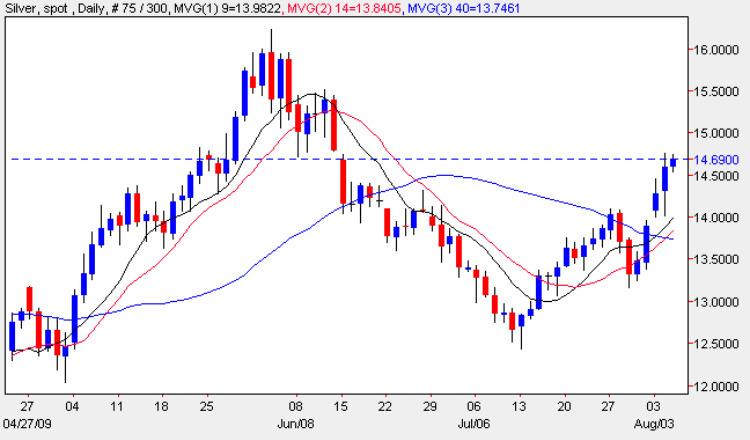 Yesterday’s wide spread up bar on the daily silver chart reinforced the bullish momentum outlined in yesterday’s market commentary for silver prices which was indicated by the gapped up opening of Monday morning. From a technical perspective the deep lower shadow of yesterday’s candle suggests that we should see a further push higher in spot silver prices in due course with the $15 per ounce price handle now clearly in sight. This price action is reinforced by the moving averages which are all pointing higher, with the 40 day now crossing below the 9 and 14 day. In addition any continuation in recent Dollar weakness and positive investor sentiment towards riskier assets will also add a further boost to the price of silver. However, we do need to be aware that should either of these elements change then the spot price of silver may suffer as a consequence. My trading suggestion is to continue to look for small longs using the hourly chart for suitable entry and exit points but keeping in mind the current state of the sentiment in the broader markets, especially equities.